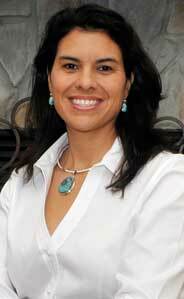 Laura Contreras-Rowe is an award winning author of Aim High: Extraordinary Stories of Hispanic and Latina Women. She has traveled around the world speaking and inspiring women of all ages but her passion lies in helping underpriviledged women realize their value and worth. Born in Dallas, Texas but raised in Laredo, Laura offers students, adults, and business persons of all industries the hope and advice they need to raise themselves to their highest potential. Her training and expertise has brought her all over the country as well as abroad. Recently, she has had the opportunity to conduct seminars for Keller Williams Realty in Tulsa, Oklahoma and the Remax Argentina National Convention. Laura recieved her BS in Broadcast Design and Telecommunications from Oral Roberts University in Tulsa, Oklahoma and is a franchise owner of Keller Williams Realty located in California and Virgnia Beach, Virginia. When asked what inspired her to write the book Laura speaks of her own experience and how she was curious as to how many other latina women went through a similar journey such as hers. Laura mentions that in her research she discovered latina women have the highest suicide rates for 8th through 12th graders, the highest percentage for drop out rates, and the highest percentage of teenaged pregnancies. Scary statistics…for a latina woman who has seen these statistics in real life…absolutely! Yet, Laura, like many women in her book, is proof that positive outcomes can come from otherwise very gloomy circumstances and she has devoted her life to making a positive impact on all those in similar circumstances. This is precisely the reason why she founded “Got Sole”… an organization dedicated to donating new or lightly used shoes to the underpriviledged population of the Eastern Shore and Hampton Roads, Virginia. As a latina woman I am proud to highlight the wonderful light that Laura has demonstrated in her actions, her attitude but especially in her journey. A special thank you for being a positive role model for writers such as myself as well as an extraordinary business-woman. Que Dios Te Bendiga! If you would like contact Laura to speak at your organization contact, click here. So, when I first decided to initialize this blog I decided that I wanted to share stories of people who not only shined but allowed the beauty within to expand out…something that went past just the surface. So, when I started blogging for the Raven Maria Blanco Foundation I knew that at some point I would have to speak about the wonderful people who have dedicated so much of themselves to this cause. On March 9, 2007, 8-year-old Raven Maria Blanco passed away unexpectedly, leaving family and friends with the challenge of learning to live in a world dimmed by her absence. Raven’s passing was devastating, especially to her parents. In an instant, the world cracked, swallowed joy, and the little angel disappeared. Imagine a room of bright lights, glittered streamers, laughter bouncing off the walls, star-lit ceilings, and music dancing in the air – then darkness and silence, disorientation and pain. There are no words to express the void we have in our hearts. Raven’s short, spirited life touched so many people; we are truly blessed for each and every moment we had in her presence. Raven died under conscious sedation during a routine dental procedure. The autopsy showed Raven had a blood concentration of 24 mg/L of chloral hydrate — three times the average range — which the medical examiner considered lethal. After the loss of Raven, her mother Robin clings to her daily routine as a way of somehow maintaining normalcy. She constantly adds items to her to-do list; staying busy is a band aid to the wound that never heals. Robin also helps her other two children deal with the loss of their sister. Raven was the oldest, the one they looked up to. Now when they miss her, they look to the Heavens to feel the sun rays of her heart and the glimmering stars of her curiosity. Robin also devotes her time to making a difference in the lives of children. Mario, Raven’s father, watched his world crumble after the death of his first born child. He left living, lost somewhere in the limbo of grief. He could not move in the fog. For a little over a year, Mario spent his day’s sitting by his daughter’s gravesite and writing to Raven on her website every day. One day, love and chance gave Mario the strength to pick himself up. Thus begun the RMBF, Inc.. In all honesty, I can’t imagine a world where my children don’t exist…none at all where they were taken away from me unexpectedly. So to think that this family, still grieving in a pain that never ceases, decided to use the pain of their loss to help others…well I can’t think of a brighter light than that. RMBF, Inc. is dedicated to the education and advocacy of Pediatric Emergency Preparedness. Mario and the rest of the family believes that perhaps had the office been prepared to handle the situation his daughter, his angel, Raven Maria Blanco, would still be here with us today. Over the years there has been several deaths of children due to similar causes and the foundations provides resources for Dental Health Professionals, Educators and Parents to become better prepared and aware of the preventative tools available. While RMBF, Inc has worked extremely hard to get the word out to individuals that can make a change…there is still so much work to be done. So RMBF, Inc. representatives participate in several dental forums and conferences a year trying to advocate their cause. However, never did Mario Blanco think that he would just happen to meet Grammy Award Winning composer/producer Michael “Magnedo7” Crawford and much less that, after telling Raven’s story, Michael would want to write a song in her dedication. But it did happen! In fact, Michael Crawford’s wife Shameia honored them all by singing it live at the RMBF Masquerade Ball. RMBF, Inc. would like to offer their deepest thanks and appreciation to all those who participated in this project!